More than half the people who are using search engines (i.e. Google, Yahoo and Bing) are doing it using a mobile device, such as a cell phone, a tablet like an iPad or even a laptop. Because of this, Google is starting to ensure that the search experience is geared more towards mobile. Here are three reason you need to get ready for this. According to comScore, the number of searches performed using a mobile or smart phone is around 51% and growing. Desktop use is now around 42 percent and falling. That means that for every 100 searches taking place, approximately 51 are using a mobile device. These are people possibly searching for products, searching for services and searching for someone to do business with. 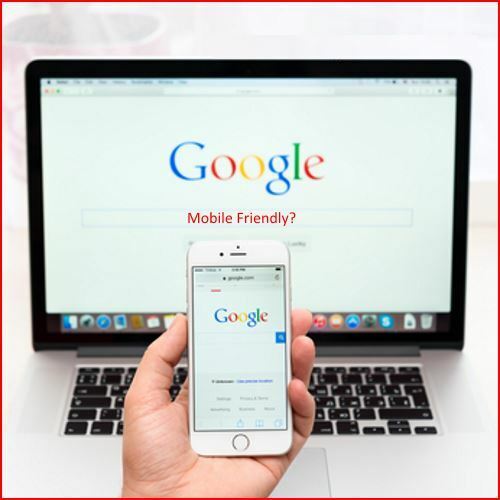 If you are one of the unfortunate ones who has a non mobile friendly website and there are many, you could be losing out on a lot of sales opportunities for your business. There’s no secret to why this is happening, we live in a world where people are spending more time on the go. We now live in a world filled with people who own laptops, mobile phones and tablets that are routinely connected to the Internet. It has allowed them to search on the go for whatever they want. Effective April 21st, 2015, Google began using whether or not a website was mobile friendly as a ranking signal. This means that those site that were considered mobile friendly (by Google) would begin to get ranking points or preference over those sites that were not. With this change it became clear that Google recognizes that it must provide quality user experiences to mobile searchers. How Do I Know if my Website is Mobile Friendly? After I found out that this change was going to take place, I mentioned this change to a friend and they asked their webmaster if their website was mobile friendly. He told them yes, but when I tested the site using Google’s mobile testing tool, it failed miserably. Either the webmaster was misinformed or he lied. Don’t take someone else’s word for it, find out for your self. You can do this by visiting the Google Mobile-Friendly Test page. All you have to do is enter your website address (www.yoursite.com) and then click the “Analyze” button. You will then be shown the results of the test. To learn how to fix your site if Google says it’s not mobile friendly, you can use my FREE mobile friendly eBook. 3. You Will Start to Lose Business! Here is where the rubber meets the road… If you do not have a mobile friendly website or you don’t think it matters because you know better than everyone else, you’re going to be in for a big surprise. What this means is that you will start to lose traffic and lost traffic will eventually equal lost money. Since you are more than likely in business to make money, I am willing to bet you don’t want that to start happening. So take action to ensure that your site is “Google Mobile-Friendly”. The world is changing, people are more mobile and are using there mobile devices on the go more. As a result, Google is giving their searches more preference. If your website is not mobile ready, it will start to effect you negatively, costing you lost sales and eventually cash. To prevent this, you need to fix your site. Either you can do it yourself or you need to hire someone to do it. For the DIY’ers, my “Build Your Own Business Website” guide, will help step you through the process of creating a mobile friendly site using WordPress. Whatever you choose to do, Good Luck! If I can help you I will do that, so feel free to contact me with your questions. If you don’t have a website, you have a whole other problem. Better get one fast, the success of your business may depend on it. Learn how to build your own business site at my “Build a WordPress Website” page.